Brain and spinal cord protection is made possible by enclosing these structures within bones such as the skull and the verterbrae, presence of the CSF that creates a watery cushion and the presence of the membranes or meninges. This section will focus the discussion about the function and anatomy of the membranes or meninges. The central nervous system structures are covered and protected by the three layers of meninges. Since nervous tissues are very soft and delicate even when just exposed to the slightest pressure, presence of intact meninges play a very vital role in the normal functioning of the structures of the central nervous system. Outermost meningeal layer – this is the leathery dura mater and is a double layered membrane. It is tough or hard covering that surrounds the brain. One layer of this mater is attached to the innermost surface of the skull forming the periosteum or the periosteal layer.the outermost layer, called the menigeal layer forms the outer coverings of the brain and it continues and becomes the dura mater of the spinal cord. Middle meningeal layer – this is the weblike arachnoid mater. It has threadlike extensions that span the subarachenoid space to attach to the innermost membrane which is called the pia mater. Innermost meningeal layer – this is called the pia mater, otherwise known as the gentle layer. Pia mater is a delicate surface that tightly attaches the surface of the brain and spinal cord. A serious threat on the brain and the spinal cord if bacteria or viruses enter the meninges. 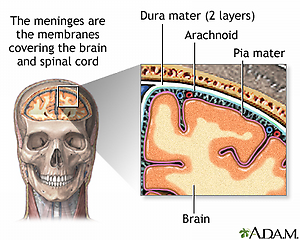 The inflammation and infection of the meninges is called meningitis. This inflammation may spread into the nervous tissue that would result to encephalitis. To diagnose problems in meningeal layers, a sample of cerebrospinal fluid from the subarachnoid space should be subject to culture and sensitivity test.